This 1953 view shows the 500 block of W. Washington Street as it appeared in 1953. This week we share another 1953 photograph of Indianapolis taken by J. Parke Randall, a young architect/photographer charged with documenting potential areas of urban development for his boss Edward Pierre. While today the commercial district along West Washington Street ends east of the State House, prior to the 1960s shoppers continued west to White River. 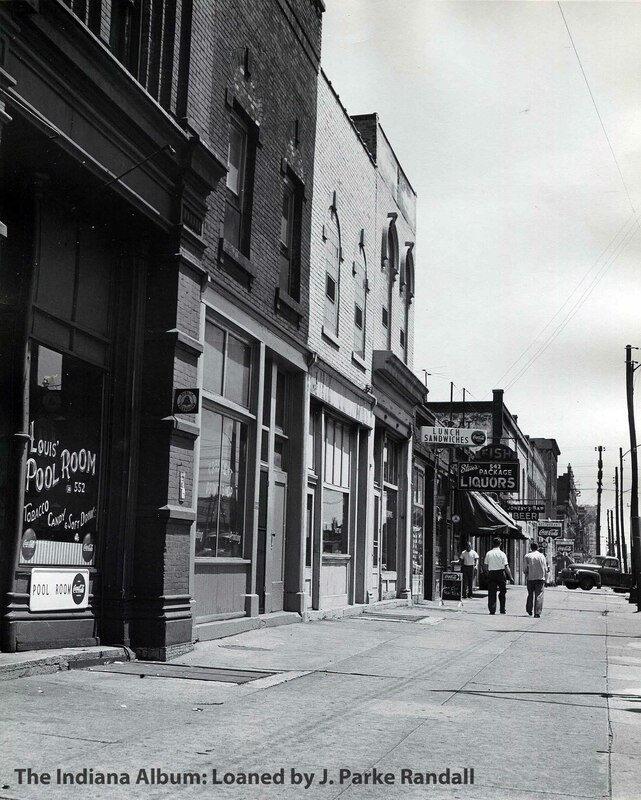 As seen in this 1953 photograph, which looks east at the north side of the street, the area had a much grittier feel than downtown with a hodge-podge of businesses and upper-floor apartments. 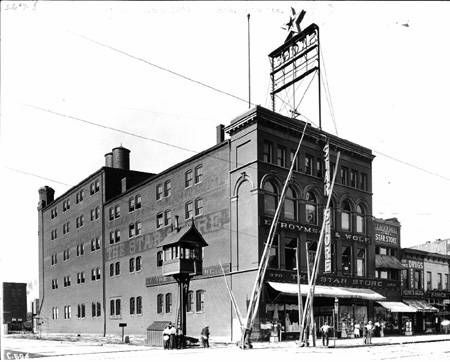 The late 19th-century brick buildings housed businesses including Louis’ Pool Room (552), Steve’s Package Liquors (542), Jonesy’s Bar, and several lunch rooms with Coca-Cola signs. Polk’s 1949 Indianapolis City Directory reveals that this long block stretching between California and West Streets was home to Peter Dufek sign painter, Globe Industrial Supplies, Riley Apartments (with eighteen apartments), Spivey Brothers Roofing, Crescent Print Shop, Esau R. Owens restaurant, George Michael shoe repair, Columbia Fish & Poultry Co., Vasil Arnaudoff grocery, Harold Waechter restaurant, Frank J. Muecke veterinarian, the Cozy Lunch Room, Vangel Shishcoff jeweler, Harry Wiess liquors, Thomas K. Martin barber, Charles W. Martin used furniture, J. Christ Counia barber, Joseph C. Nungester restaurant, the Carlisle Block apartments (with eleven apartments), and Suess Pharmacy. In the distance is a sign for the Star Store, a more affordable option than the better-remembered downtown department stores such as Ayres and Blocks. 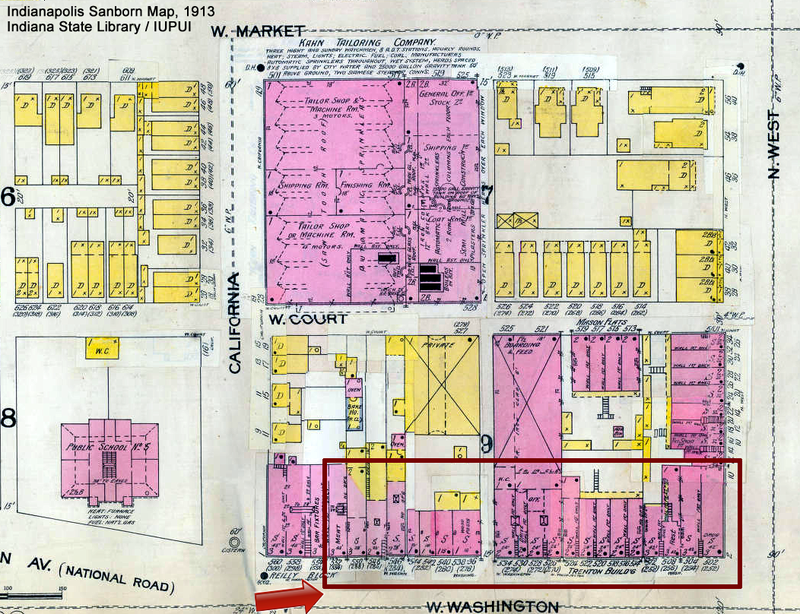 As seen in this 1913 Sanborn Fire Insurance Map, the 500 block of W. Washington was solid with two- and three-story brick buildings, many built in the Italianate style and dating as early as 1887 (the first year that these detailed maps are available for the city). 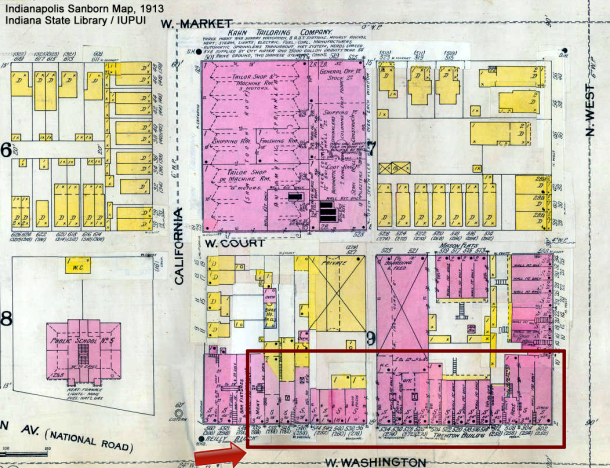 Lack of zoning, and an era where people needed to walk to their jobs, created a block that contained a mixture of commercial buildings (colored pink to indicate brick), houses (yellow to indicate that these are wood structures; note the seven one-story shotgun houses tightly built along Court Street, which was an alley), and a quarter of the block was home to the Kahn Tailoring Company. To the west is the old Public School 5, replaced in 1922 by the Oscar C. McCullouch School 5. During a preservation dispute, in 1985 the White River State Park Commission partially razed the school, but a court granted a stop work order and Indiana Landmarks salvaged the facade. Today one wall of the brick and terracotta school can be viewed in the nearby Indiana State Museum. 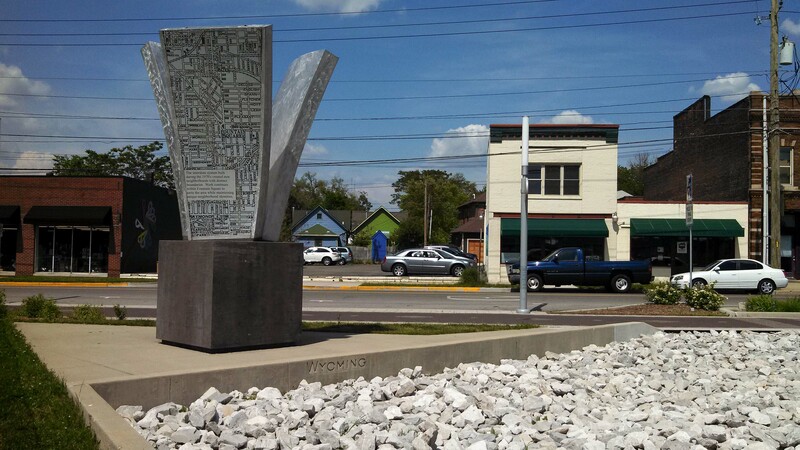 Today the 500 block of W. Washington Street is the lawn and sidewalk for the Eiteljorg Museum of American Indians and Western Art. Photo Courtesy of Tammi Burns. 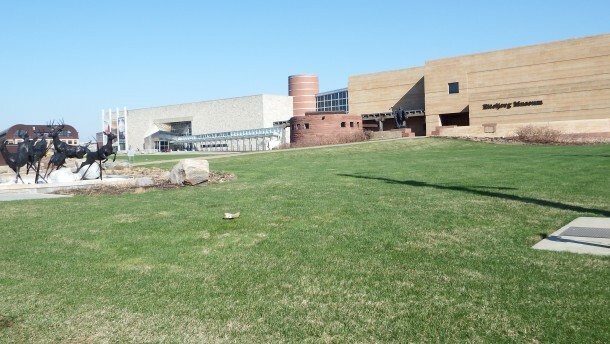 The Whitetail Deer bronze sculpture and the south lawn of the Eiteljorg Museum of American Indians and Western Art now occupy the site of this once-vibrant block. A Holiday Inn replaced the structures east of the alley by 1962 and the other buildings gradually met the wrecking ball through the 1980s. The Eiteljorg opened as part of White River State Park in 1989. All that remains of the many businesses along this block are family stories, photographs, and ephemeral mementos such as matchbooks, advertising, and menus. Please share your memories and contact us if you have photographs or other items to be scanned by The Indiana Album: a community-submitted digital collection. 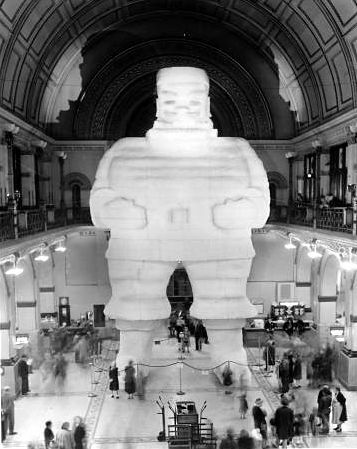 Noting your reference to late Ed Pierre, there is a bit of history that has disappeared because it has never been properly documented and there was little written history as it evolved because it involved this influential architect’s “vision” and his primarily behind-the-scenes tenacious crusade to create what today we accept as one of our city’s “tradition”—with only a few who remember how it came about. In the period when things started “happening” after WW11–for all the years of the war and right after, our city and the rest of the nation had to “put on hold” traditions like the 500 and civic projects just to survive. But in the next few years after the war’s end, as events halted by the war like 500, things began to happen–and the then 3 local newspapers were the “motivators” that helped create things we accept today–Popular Times, then Star columnist Lowell Nussbaum almost single-handedly crusaded in print to create what is now our Indy Zoo (he literally created through his sustained campaign, actually lived and died for the Zoo–ironically not a single thing is named for him there!/similarly artist Elmer Taflinger envisioned, crusaded for and created Holliday Park RUINS.—-AND NOW WE COME TO ED PIERRE. And, in retrospect, his “crusade” was a bit bizarre–after all, how in the world and why in the world would any one want to string giant strands of colored lights to turn the city’s most solemn edifice=-=the iconic Soldiers and Sailors Monument–into a pyramidal CHRISTMAS TREE.???? But He Did! I don’t know how many pre-season years he relentlessly dreamed, talked, campaigned to get his idea off the ground and into the sky…I cannot remember the time line–only that at mid-year his face would appear and the people in the know just rolled their eyes in “Ed Pierre’s still at it” mockery. Worth some research for accuracy–all I can remember is gradually his idea got into print, got hooted at, and little by little became what it is today–with “father unknown”. This is interesting to me. I have a photo of the old school 5 sitting in front of the new school 5. The photo is from an outdoor sign companys location inventory. Also all of our ice cream factorys cart operations for its vending companies drexler ice cream, best test ice cream, lilly ice cream etc. and several others all dropped off the days take at the building on the corner of California and Washington …. 30s through the 60s …. they called it the change room …. basically a large room on the back of the building where change was dumped until someone could run it though the sorters. That building was an amazingly beautiful 3 story italianate. I maybe one of the rare few that saw a great deal of beauty in the area west of west street to the river. It was a very old part of town…… gone and very much forgotten. I would like to see something eventually on the Western Liberties Fire House. We always hear about Eastern …. never Western. Western became No.6 and fought the big blazes of Kingan ….. especially the May 22nd 1865 Fire which paid off 210,000 to Kingans …… Probably the biggest of all fires ever in the city …. started in the Lard building ……. very few words ever really written about it. When the excavated for the JW I went down to see the unearthing of probably the last artifact of that era, a 600,000gal cister built by kingans as required by the 1865 insurance settelment. 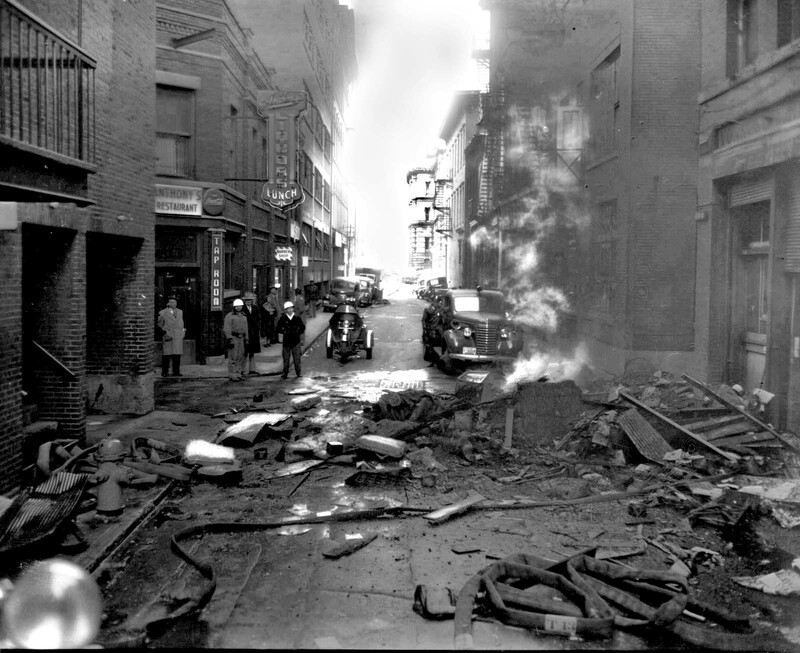 A photo was in the paper which exclaimed it to be a hidden room with fireplaces on the ends ….. but in fact those were draft stacks for the pumpers to drop their hoses……. even the White Castle at Washington and California had historic Character. As you walked in the door the sidewalk had many impressions of horse shoes from the blacksmith who was there before. When White Castle moved in the blacksmiths shop (cooper)moved to the rear of the property still operating. …. if im not mistaken Kirkpatrick was just a couple doors west ….. easy enough to look up in polks. Nice photo of Washington street ….. Thank You. Not sure if you are the “right” (!) John Pappas, but Libby Cirezniak gave me your name as a contact for Kingan & Co. in Indianapolis. Please get in touch with me if this is correct. Thank you.